When the Houston Rockets decided last summer to invest $87 million in Dwight Howard, it only seemed natural that the franchise would enlist the greatest player in its history — retired Hall of Fame center Hakeem Olajuwon — to use his renowned skills as a big-man coach to help make Howard, the best center in the NBA today, even better. The sessions appear to be working, as Howard (18.6 ppg, 58.9% FG) is close to putting up the same numbers he put up with the Orlando Magic before he injured his back, and Houston currently has the fourth-best record in the Western Conference with the playoffs right around the corner. Fortunately for the Rockets, Olajuwon has more than enough knowledge to spread around, and they just happen to have another gifted 7-footer who can benefit from some schooling at Dream Shake University. Omer Asik, a fourth-year center out of Turkey and a practicing Muslim like Olajuwon, is Howard’s backup who could start for the majority of teams in the league. 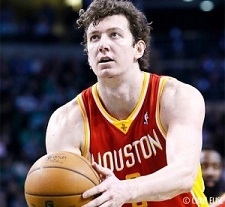 As soon as the Rockets signed Howard, Asik made it clear he wanted to be traded. And if there was any mystery regarding why, just know that this season the 27-year-old Asik is playing a little more than half as much (17 mpg) as he played last season (30 mpg), when he was Houston’s starting center. But Asik is still on the team for now (don’t be surprised if he gets traded this summer), and in the meantime he’s also been working with Olajuwon on his offensive footwork and post moves. “He tries to help me on basic moves on the offensive end,” Asik told the Houston Chronicle. “He’s helping me a lot. He’s one of the best big guys. I just try to get the most out of it and try to use it on the court. Asik will always be more of a defender and rebounder than a scorer, but he has shown potential to become an effective offensive player. He averaged 17 points in the last three games of Houston’s 2013 conference-quarterfinal series against the Thunder.